Bulgarian architect Martin Angelov has a simple game plan to beat cyclists' urban commuting woes. Take the bike path above to the skies, well, to a maximum of 15 ft over the road to be precise. Wait, what did you say? That's right. Enter the Kolelinia, an interesting transportation concept that actually won The City Transportation Interchange Brief in London last year after Martin submitted a pencil sketch proposal to them. What is proposed by Martin is a bicycle lane made of steel wire - static in all respects - unlike a ski-lift which would need electricity. 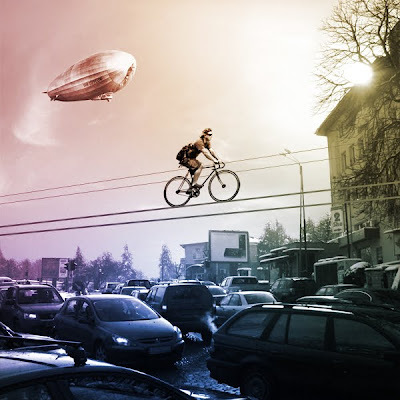 Now don't equate that to cycling on a literal wire. Actually, the proposal is for an elastic furrow, made from rubber, supported by two steel wires and about 12 inches in width. A third steel wire is for safety. The bicycle's wheels will ride in this furrow. The idea also proposes a handlebar mounted pulley system that attaches to the guide wire so that the motion of the cyclist is constrained along the furrow (and not onto the road!). What will the bicyclist have to carry with them in order to use this system? Two things : A safety harness and this pulley thing (or "personal safety device"), both of which can be carried in a backpack prior to "boarding" the sky lane, according to Martin. "I want to achieve a complete independence between the car and bike stream in the zones where they intersect each other. Kolelinia generates additional space in places where there is no room for bicycle-lanes. I want to prove that it is possible to move on a higher level (4,5m max) with a minimum of resources on a weightless network. Of course, absolute safety comes first. Last but not the least, I would just like to provoke people to look at transportation from another point of view, just like the sci-fi movies make us dream!" I'm not sure whether it was a sci-fi movie that came to my mind first when I saw the drawing plans for this idea on his website. I think what came to mind instead was the suspended walkways failure at Hyatt Regency in Kansas (1981) that killed 114 people in one shot. I translated that fear to Martin, asking him whether he's got his engineering calculations right for the structure he's proposing. I also asked him who he plans on giving this ultimately as a contract to. The reply was not surprising, because the idea does seem to be in its early conceptual stages. So what is the future of this concept and how does it go from concept to prototype to realization? Will it see the light of day in the litigious environment most we us live in? First, I have to make a team for realizing a basic hand-made prototype of the concept (10-15m long). Only this prototype will show us the real problems with the design. Second, after we have already dealt with all the issues, we have to build something bigger, let's say something for entertainment. A short touristic line in the city or an extreme line somewhere in the nature or a whole mountain-bike trail, for those who are looking for adrenaline. If all prove that it is safe, the system will find its place for mass use naturally. Nobody will make you use it if you don't want to. I'm working on the first step now and I'll cover each step on my website. In addition I'm working on a completely new concept, but it is early to talk about it." Here's one personal thought to Martin. 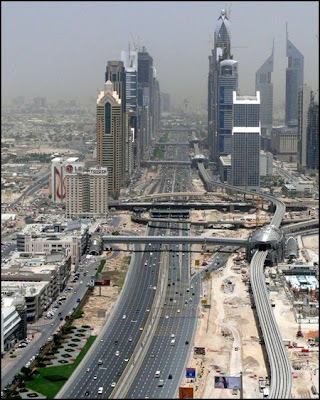 If you happen to visit a bustling city like Dubai, where traffic congestion is at its height, transportation planners have realized simple methods to help people get across huge highways. One is in the picture on the left. To use this, all you need to do is mount a pair of steps or ride an elevator and then walk, or ride your bike on this overpass. No need of cables, harnesses and things of that nature. What's nice about it is that it is enclosed so you're protected from the elements. The biggest advantage is that it can be used not just by cyclists, but by any individual, just like actual bike paths. I don't see it as an easy task, this idea of spending public money to provide just cyclists with their own little fancy skylane. Not to discourage you. It's a nice idea but I don't see this finding favor with development authorities easily. What do you readers have to say?